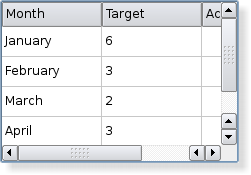 The table has a vertical header that can be obtained using the verticalHeader() function, and a horizontal header that is available through the horizontalHeader() function. 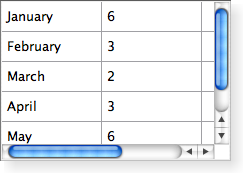 The height of each row in the table can be found by using rowHeight(); similarly, the width of columns can be found using columnWidth(). They are both just QWidgets so you can hide either of them using their hide() functions. 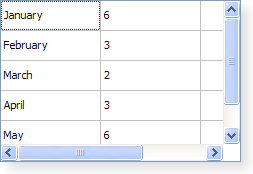 Sets the span of the table element at (row, column) to (rowSpan, columnSpan). If you reimplement this function in a subclass, note that the value you return is only used when resizeColumnToContents() is called. In that case, if a larger column width is required by either the horizontal header or the item delegate, that width will be used instead.